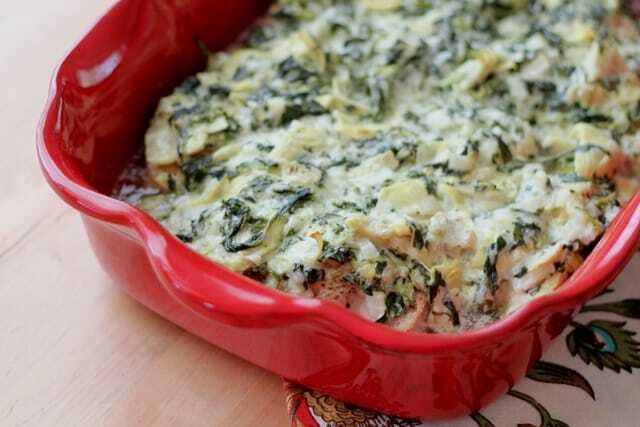 Spinach artichoke dip meets chicken in this absolutely delicious meal. I ran across this recipe on my friend Robyn’s blog and immediately added artichokes to my shopping list. I made this the week before Christmas and then I made it again last week. My oldest son is not a big fan of chicken and he requested the leftovers both times. I served the chicken with roasted potatoes and a salad the first time I made it. The next time, we chopped up a couple of the pieces of chicken along with the sauce and we scooped it up with tortilla chips. This chicken also pairs nicely with pasta or rice. I’m sure it’s going to be on our menu many times in the future. * I've used whole artichoke hearts as well and they work fine. 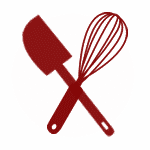 They will break apart when you stir the dish. ** I've also used 1 cup shredded Italian cheese blend in place of the cheeses listed above. Preheat the oven to 375. Grease a 9x13 baking dish with oil. Cut the chicken into serving size pieces. If your chicken breasts are very thick, slice them lengthwise to create thinner fillets. You might also want to cut them in half if they are very large. (I wound up with 8-10 pieces of chicken from 3 gigantic chicken breasts.) Salt and pepper the chicken on each side and then place flat in the baking dish. Bake for 15 minutes. While the chicken is baking, combine all the remaining ingredients in a bowl and stir to combine. 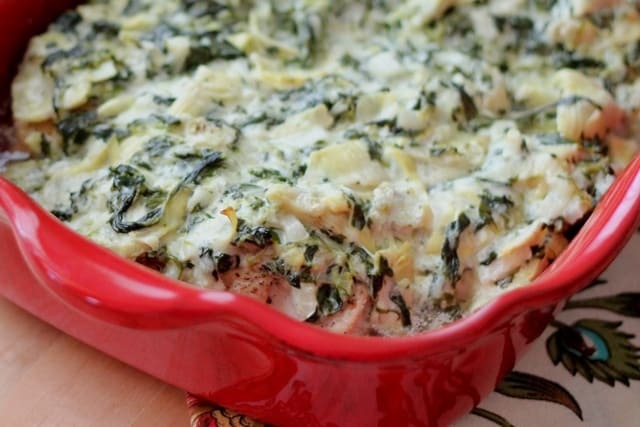 After the chicken has baked for 15 minutes, scoop the spinach mixture over the chicken and continue baking for an additional 20 minutes. Test the chicken to make sure it is cooked through and bake another 5 minutes, only if needed. Let rest 5 minutes before serving. Enjoy! 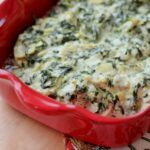 One of my favorites is spinach artichoke dip so I can imagine how good this must be and it's on the list to try. My favorite dip as a dinner? Love this-pinning now! I bet this chicken pairs nicely with a spoon! Delicious indeed :) Happy New Year Mary~! I love that this recipe turns dip into a dinner! I also love that you ate it with chips one night and turned it back into a dip...LOL! Oh yes, seriously drooling over this!